Exploring Scotland’s capital could easily take an entire week. 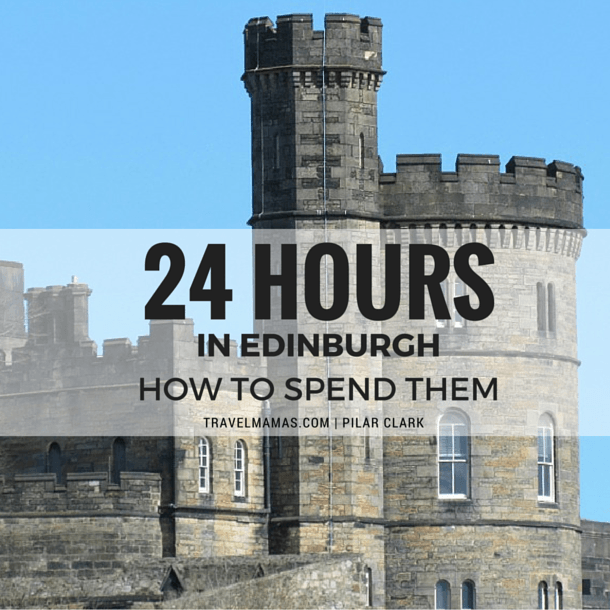 But, if you only have 24 hours to spend in Edinburgh, you’ll be glad to know the city offers plenty to see and do no matter the time frame. My suggestions will keep you busy from dawn till dusk, with a whirlwind of historical landmarks, popular sights and eateries that ensure you’ll fall head over feet for Dùn Èideann (Scottish Gaelic for “Edinburgh”). Start your day by traveling back in time. Walk the cobblestone streets of Edinburgh’s Old Town. Most of the city’s main sights can be found here, and together with New Town (the 18th-century central area of the capital city), it forms part of a protected UNESCO World Heritage Site (a place that is listed by the United Nations Educational, Scientific and Cultural Organization as being of special cultural or physical significance). Check out the shops, museums, galleries, cathedrals and street performers (bagpipers!) while strolling along the main thoroughfare. 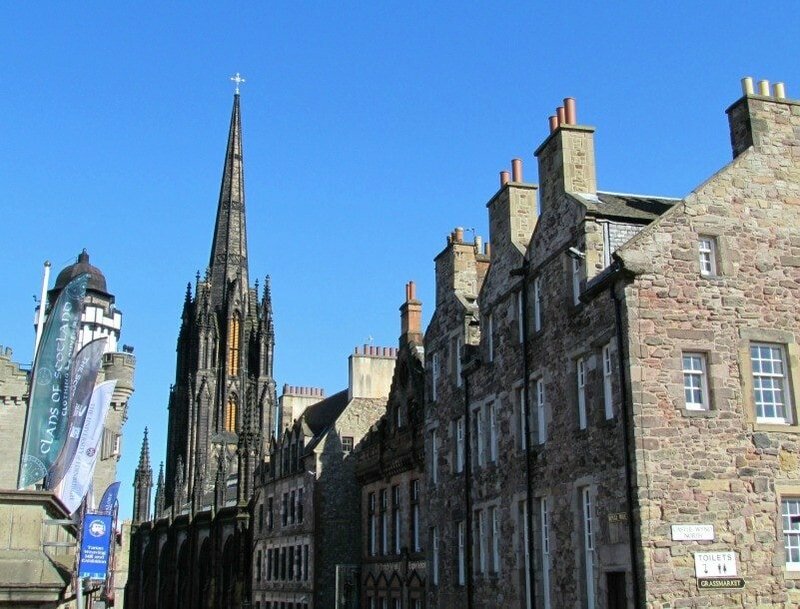 Called the Royal Mile, the busiest tourist street in Edinburgh runs from Holyrood Palace, one of the Queen’s royal residences, to Edinburgh Castle, which is situated atop the 430-foot tall Castle Rock overlooking the city. Tip: Window shop but don’t buy anything until evening; you’ll be walking back down the Royal Mile again, and sightseeing is much easier when you don’t have to carry heavy tartans, kilts and Arran knits. Edinburgh is also the world’s first accredited UNESCO City of Literature. The award not only recognizes the city’s literary roots, but also is a pretty impressive acknowledgement of its dedication to literature. 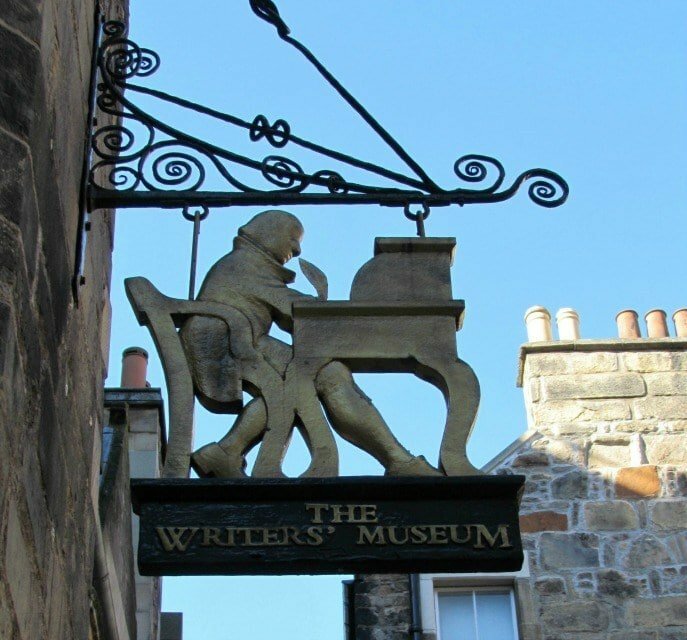 Makars Court, nestled at the top of The Royal Mile, is home to the Writers Museum, and contains portraits and works of some of Scotland’s great writers, including Robert Burns and Robert Louis Stevenson. Surrounded by a small, unassuming courtyard, scattered underfoot you’ll find paving stones carved with the names of famous writers from the 14th century through modern day. Next, head to Princes Street Gardens at the foot of an artificial hill called the Mound. This verdant public park separates New Town from Old Town. It boasts gorgeous tiered gardens, statues, monuments, and a clock made entirely from flowers. 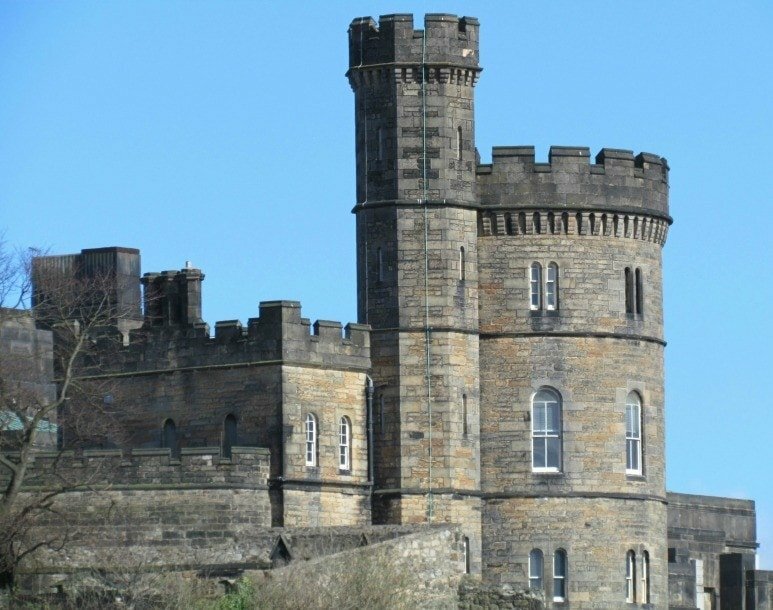 A 200-foot Victorian Gothic monument built in honor of Scottish author Sir Walter Scott is housed there, and adventurers can climb all 287 steps to the top. Sweeping views of Edinburgh from the viewing deck of the sandstone tower make for a spectacular reward, and are totally worth the early morning workout. 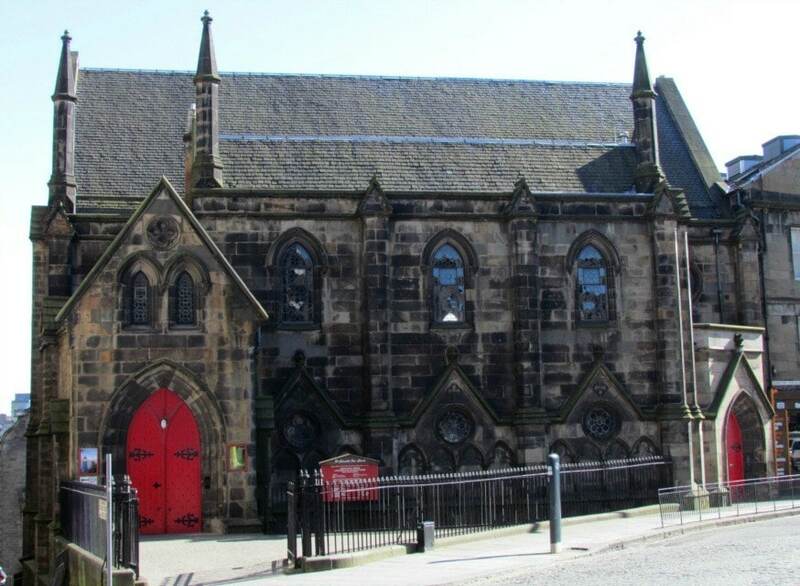 A stone’s throw from the Elephant House, you’ll find Greyfriars Bobby. 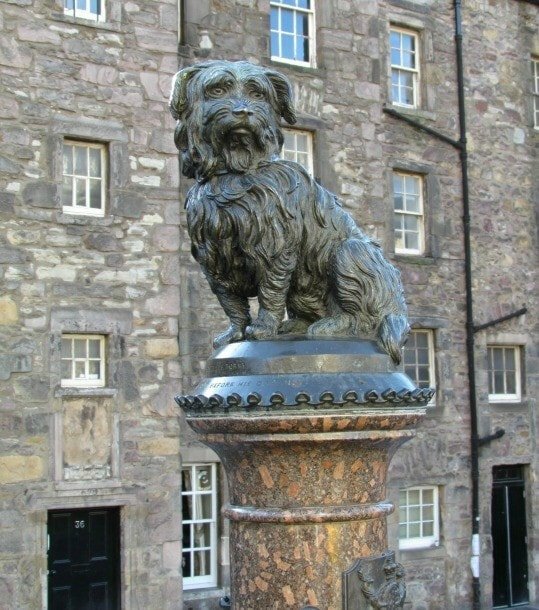 This popular statue-turned-photo opp commemorates one of Edinburgh’s most beloved, four-legged residents. The little Skye Terrier named Bobby faithfully guarded his owner’s grave in the nearby Greyfriar’s Kirkyard for fourteen years. A five-minute walk from Greyfriars Bobby down George IV Bridge will bring you to the National Museum of Scotland and its impressive Crystal Palace-inspired, glass-domed main hall. The museum provides great way to explore the nation’s culture, history and people. Plus, the 360-degree views of Edinburgh from the roof garden are crazy amazing. Better yet, it’s free to wander the museum’s halls (though special exhibitions may require a fee). Afterward, stop by Dovecot Studios, the oldest working tapestry factory in Scotland, for a demonstration of the ancient art of weaving. Housed in a light-filled Victorian bath house, it’s where master weavers create contemporary art using techniques that have been in place for generations. Remember that early-morning workout at the Scott Monument? It’s time to repeat it. Scale the summit of Arthur’s Seat (takes around 30 minutes), which at 823-feet, is the highest of Edinburgh’s seven hills. The dormant volcano is the perfect place to take in panoramic never-forget-them-views of Edinburgh as the sun sets over the city. As dusk falls, tuck into a relaxed family dinner at Hadrian’s Brasserie located in the Balmoral Hotel on Princes Street. I highly recommend the homemade piccalilli on brioche; haggis with neeps, tatties and whisky cream sauce; goujons of haddock with creamy mash; Blairgowrie beef burger topped with Mull cheddar, bacon, mayonnaise and rooster-cut fries; and the flambée with a dram of Balmoral Scotch Whisky. Afterward, head to North Bridge, which is just a three-minute walk from the Balmoral Hotel. As night blankets the city, you’ll see both Old Town and New Town light up. My family giddily explored Edinburgh with Adventures by Disney. The Scotland tour was the first Adventures by Disney itinerary inspired by a movie (Brave). The trip makes for an unforgettable escorted group travel-turned-family vacation experience. Disney adventure guides take care of all the logistics – transportation, accommodations, activities (some just for junior explorers), food and drink, and every detail you could possibly think of while abroad – while guests simply enjoy. While Disneyfied touches enhance the trip for sure, they don’t overshadow it. Instead, guests get a behind-the-scenes look at Brave’s development in the form of travel diaries, concept art and visual explanations from director Mark Andrews and his team. No matter if you go with Adventures by Disney or if you explore Edinburgh on your own, you’re sure to have a bear-sized good time in Scotland’s capital city, even if you only have one day to explore! Have you ever been to Edinburgh? What would you see and do if you had 24 hours in the Scottish capital? Let us know in the comments below! A Note from The Offbeat Travel Mama: My family and I explored Scotland as guests of Adventures by Disney. Their Scotland itinerary launched in 2013, and included a condensed five-night media trip. As always, opinions and experiences are my own. We also had one day in Edinburgh, and covered many of the same key sights! I also highly recommend a hike up Arthur’s Seat if you have school-age kids (say, age 9 and older). Oh to be there now! Edinburgh is beautiful. You did very well in just one day! I’d agree with walk up to Arthur’s Seat but if the festival is on, you will need far, far longer! This Disney trip sounds really good fun though, especially for littler members of the family. I wish we’d had much, MUCH longer, Sarah 🙂 What festival did you attend? This sounds so exciting, but I definitely want to be in Edinburgh as long as possible! Thank you for sharing. Thank you for commenting! Trust me, we would have spent months in Edinburgh and the surrounding countryside if we’d had the time. Still swooning. I love Edingburgh! the architecture is really cool as well as the Scottish fun-loving attitude. I’d definitely take the kids to the castle if I had only one day there. I never made it to Edinburgh despite living in the UK for 2.5 years. Shame on me! It’s on my bucket list though. I’d love to go to the Edinburgh Tattoo. We didn’t make it to the Edinburgh Tattoo either, though we have a long list of missed stops for our next trip back. Like good junior wanderlusters, my kids can’t wait to go back and explore! I have been to Edinburgh, but never with my family. I was just out of University and went for the Fringe Festival. This itin looks solid and I was always curious about the coffee house Harry Potter was written in. Do they have cozy tea shops for cream tea in Edinburgh, or is that just an English thing? 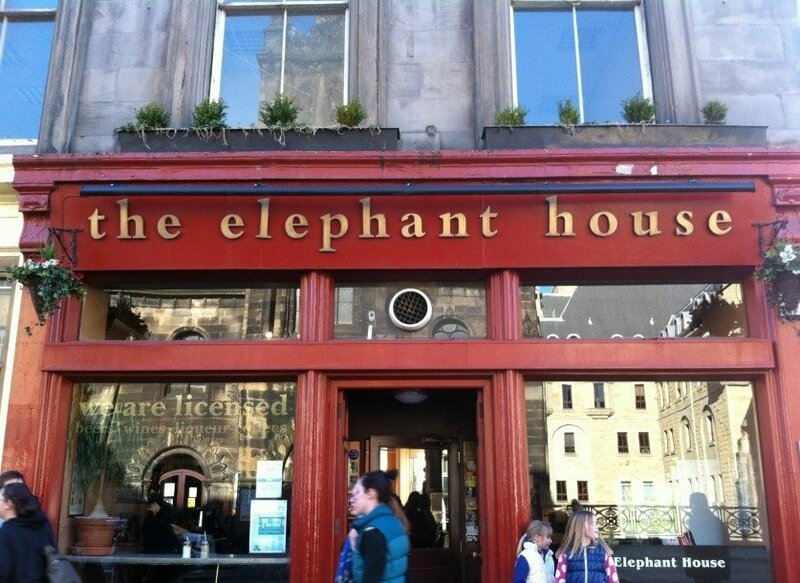 The Elephant House is a cute stop, especially for Potterheads or Bibliophiles. As for cream tea, I found that most tea shops in Edinburgh offer it, along with the warm standbys Americans are used to ordering at their neighborhood coffee shop. This city is on my bucket list for sure! And now that I know that it is “disneyfied” I think that makes the history a bit more fun for the little kids! Thanks for the info! Adventures by Disney does a top notch job at infusing elements of Disney magic into the experience without making it completely Disneyfied, Lindsay. We really loved that about our experience since we wanted our kids to experience real Scottish culture.